A crane operator from Dawes Rigging & Crane Rental maneuvered the Link-Belt crane into place. The weight of the plane was transferred from its display pedestal to the crane’s extended boom. The pedestal’s bolts were released one by one. With the last, the aircraft lurched free, and was briefly “airborne” once again. This moment of flight was perhaps the most poignant nod to U.S. Air Force Captain Lance P. Sijan. He was an exceptional young man who was lost to his family and friends in the Vietnam War at the age of 25. But his story of determination and dedication endures. For more than two decades, at 440th Airlift Wing of the Air Force Reserve in Milwaukee, Capt. 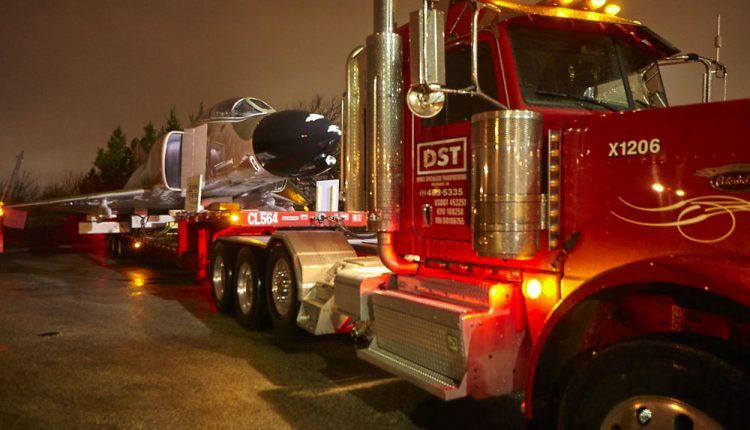 Sijan had been honored with a decommissioned, dedicated McDonnell Douglas F-4C Phantom jet fighter—a replica of the plane he was in when he went down. Then the 440th moved to Fort Bragg in North Carolina. It was important to Sijan’s sister, Janine Sijan Rozina, to keep Lance’s story alive and the symbol that represented him in his home state. Through her dedication and persistence, she was able to get the plane relocated to a new plaza at the entrance of the General Mitchell International Airport in Milwaukee, where it would stand as a memorial for those who have served and to represent his courage, sacrifice, and leadership. Moving a 26,000-pound plane is not a simple task. But gradually, Sijan Rozina assembled a team of contractors to make it happen. Each donated their time and effort to the task. Dawes Rigging & Crane Rental, a member of the ALL Family of Companies, was a proud part of this team. Planning began last summer. Dawes Sales Manager Joe Ruddell would pilot the team that would lift the plane, load it onto a flatbed truck, transport it through a shallow tunnel, and then lift and set it onto the foundation in the new plaza. Dawes’ Link-Belt HTC 86100-XL truck crane, with a 110-USt capacity, was chosen for the job along with a 53-foot Manac expandable trailer from DST Inc. (Dawes Specialized Transport). With its combination of maneuverability and strength, the HTC 86100-XL was able to get close enough to the pedestals in both locations. On a rainy, windy moving day, the truck maneuvered through a tunnel that was so tight, the plane barely fit through, even with folded wings—an 18-foot-high space, 16.5 feet of it occupied by the jet. The team proceeded carefully, mindful of the legacy of the man and his memorial. Once they reached the plaza, the Link-Belt lifted the jet off the trailer and, with precision, set it onto its new pedestal, where it was bolted into place. Onlookers, including veterans and schoolchildren, were taken by the enormity of both the plane and what it represents. The ALL Family shares a similar philosophy, resulting in its reputation for meeting every lifting challenge head on—as surely does the entire team of contractors who banded together to make Sijan Rozina’s dream happen. “We are extremely proud to be part of a community that recognizes individuals like Lance, and have been privileged to count ourselves as part of the team who made this project possible,” Ruddell said. The F-4C Phantom is poised to honor Sijan’s memory in perpetuity, thanks in part to The ALL Family and a sister who wouldn’t give up.